I have two possible go by land travel path that lead to Jump Gates. Hmm, I know what I mean, but nobody else does, hard to ignore people reading unless you are just very self-centered, I try, but just hard to turn empathy off. 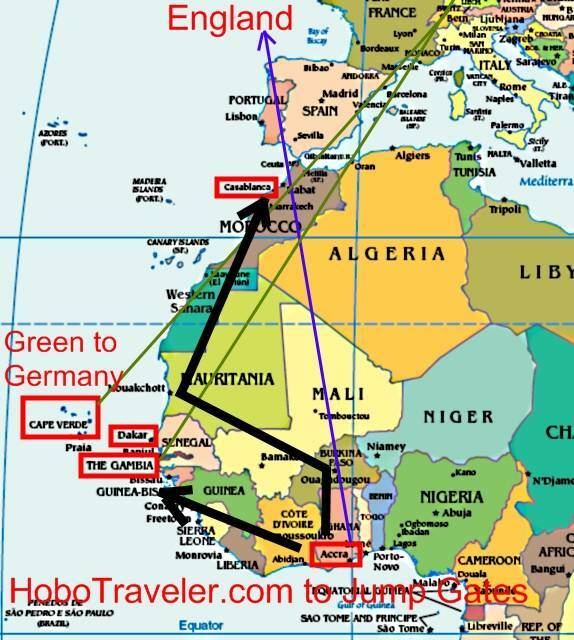 I am in Accra and the heavy black arrows represent the two possible paths towards I hope Jump Gates. I am in Accra, Ghana probably the best Jump Gate for travel in and out of West Africa. I more or less try to travel between Air Jump Gates by land and when I play the Travel Golf wrong, I have to dollar-my-way out, throw them down until I can leave. I am searching for the air ticket for less than 400 US one-way to London, England or Frankfurt, Germany, or 750 US to Southeast Asia. To fly into Paris, France is cheaper, yet when I land I get hike up by the French cost of living, so not much good. England and German are expensive; however, they have a realistically priced Hostel system if I am stuck. The best way it to just Jump Jump, I can Jump Jump to London, Frankfurt or Casablanca. However, I am in Accra, Ghana and best to buy the ticket here unless I already am sure there is a ticket from any of the onward tickets is priced right. I want to transit in Europe, I do not want to stay in Europe. I want Accra to USA or Southeast Asia for around 750. Europe to USA or Southeast Asia for around 400, to go to Asia, it almost demands I go to Germany. I am traveling towards winter, so not good options.